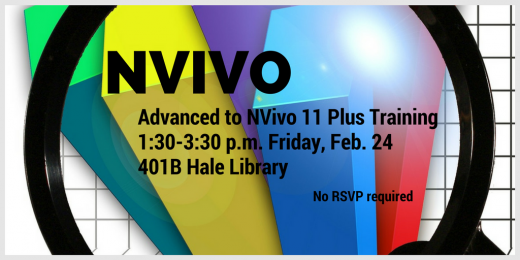 “Advanced NVivo 11 Plus” is a follow-up presentation from the “Introduction to NVivo 11 Plus” offered earlier this month. This training will be held 1:30-3:30 p.m. Friday, Feb. 24, in 401B Hale Library. how to output a basic report (including a custom codebook). The presenter will be using the Windows version of the software. Participants are encouraged to bring their laptops for this interactive session. The room will be open for this event at 1 p.m. All are welcome. No RSVP is required. There will be one additional training on NVivo 11 Plus this Spring Semester 2017. “Tapping Social Media Data using NCapture and NVivo Basic” is scheduled 1:30-3:30 p.m. Friday, March 17, in 401B Hale Library. K-State has a site license for NVivo 10 (for both Windows and Mac systems) and one for NVivo 11 Plus software for all faculty, administrators, staff, and graduate students. The site license allows two downloads and installs per eligible individual. These two versions of the software are separate installs (and both can be running on the same machine simultaneously). The activating license key may be accessed at K-State NVivo Download with a current eID and password. The software itself should be downloaded from the QSR Downloads page and activated with the K-State license. Those off-campus and / or undergraduate partners who are working with active and eligible K-State faculty, administrators, staff, and graduate students may be allowed to use the K-State license during the duration of the non-commercial K-State related research project. The NVivo 11 Plus / NVivo 10 site licenses will end in late March 2017. Since this is a proprietary software tool, all contents in an NVivo project will require the software to access. Those who will not be purchasing the software or subscribing to it may want to export their data tables and data visualizations before the end of the site license. For information about costs, please refer to the NVivo pricing page. QSR International offers video tutorials and both free and for-pay events. Those who have already started using NVivo may want to refer to “Using NVivo: An Unofficial and Unauthorized Primer,” which is an e-book built on the Scalar platform that highlights various features of the tool. If there are any questions, contact shalin@k-state.edu, or call 785-532-5262. No RSVP is needed.